Bring the Outdoors In with a Lanai Doors™ wood system. 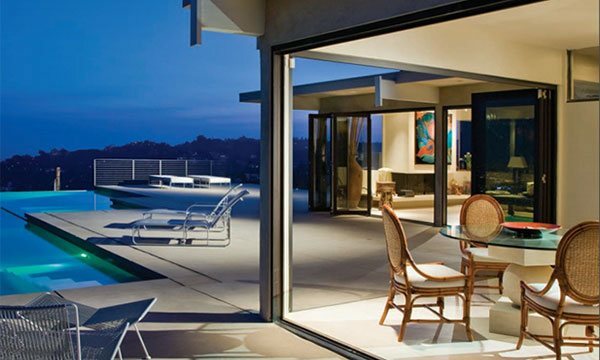 Lanai Doors™ are manufactured in the United States using the best component parts available, worldwide. One critical part is the stainless steel, top-hung folding hardware. Unlike bottom roller systems that bind or clog with debris, Lanai Doors™ wood top-hung system will open and close with ease for years. The engineered core of our wood door panels resists warping, and we can manufacture your doors with almost any wood type. With our enhanced process, your wood bi-fold glass wall system can beautifully match your concept designs or existing doors and windows. Lanai Doors™ top-hung wood folding door and window systems are a great alternative to traditional French doors, sliders, pocket doors and pass-thru windows in residential, hospitality and commercial applications. Our systems are installed from the Virgin Islands to the Hawaiian Islands; from The Hamptons to Costa Rica. Our wood door and window panels are made in every available wood species by manufacturers located in the pacific northwest and central United States. This allows Lanai Doors to provide a wood folding system that meets your needs rather than you having to compromise your options to a door we manufacture. Lanai Doors™ wood folding systems are the largest in the industry and can be configured various ways. The maximum size wood door panel is 4' 3" wide by 13' 1" tall, up to 350 pounds, and up to 2 ¼ inches thick. A single system can be as large as 68 feet wide by 13' 1" tall. In a 68-foot wide system, that would equate to nearly 56 feet of glass – what a view. 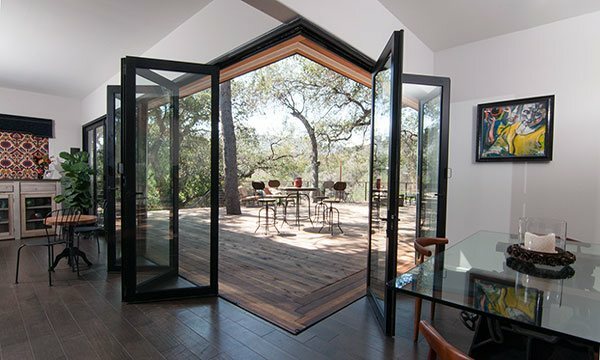 Lanai Doors™ wood folding door and window systems can be configured to stack outside or inside your house. You also have the option of any combination of panels stacking either to the left or to the right, neither direction to exceed eight folding panels. These industry leading options allow you to Bring The Outdoors In in a big way. Do not forget to ask about our corner units too. The frame and door panels are pre-drilled with hardware and weather stripping already attached. The frame is broken down into its four pieces (header, two jambs and threshold) and panels are shipped individually. 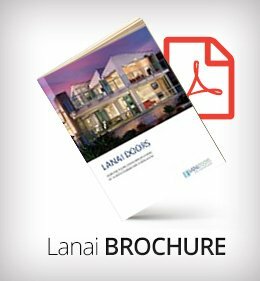 Lanai Doors™ provides detailed installation guidelines and we do not require the use of specific installers. Lanai Doors™ does not warranty a wood panel from warping which is subject to direct sun exposure. The industry rule of thumb is that a southern and western exposure requires 100 percent overhang (eight foot door requires an eight foot overhang); eastern and northern exposures requires 50 percent overhang. Lanai Doors™ wood bifold door and window systems are built to withstand harsh weather conditions. However, we currently do not have plans to obtain Miami Dade County hurricane certification. 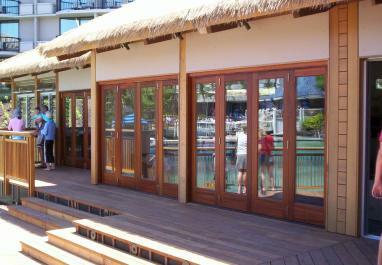 Lanai Doors wood folding glass doors and windows have been tested in the laboratory. Our wood systems have been tested for energy performance, forced entry, wind loads, water tightness, and air infiltration. All of our systems have passed the ASTM forced entry test. There are many variables that enter into testing for energy performance, wind loads, water tightness, and air infiltration; so we have organized most of the information into tables. Our products have been NFRC tested and rated. One of our focuses is on providing the customer with the most energy efficient folding doors and windows. We are committed to a greener future. Looking to qualify a LEED project? Our products can help you achieve the LEED ratings for your next project. Our focus has been on quality since day one. We design our products without compromise, and we follow through by testing to ensure our products to meet the strict testing standards for Air & Water Infiltration, Structural Design Pressures, and Forced Entry Requirements.